It is the first snow of winter in the Alaskan wilderness and, beneath a full moon, a wolf-woman cries a beautiful song to her beloved across the forest. The wolf-woman is Nei’Sha and her beloved is Mokoshan. Suddenly, a shot is fired by hunters, killing Nei’Sha. Mokoshan grips his mate and cries a howl of grief that is carried over the wilderness by packs of wolves. At camp, Ninjara hears the howl and finds it similar to the cries of her fox-people. Raph asks her what’s wrong and she snaps at him, telling the Turtle to leave her alone. The next day, at Fairbanks International Airport, The Turtles, Ninjara and April bid farewell to Oyuki. April is sending her off with their old friend Tattoo to cover the Sumo-Fest in Japan. Oyuki and Tattoo board their plane, leaving Inky behind on the tarmac in his pet-carrier. That night, on the Dalton Highway, the Turtles, Ninjara and April are struggling to reach the next town as their truck fails on the snow-covered gravel road. Raph, meanwhile, is failing to reach Ninjara, who still refuses to talk to him and explain why she’s acting so cold and distant. April stops her truck to check the map and another truck operated by locals pulls up beside her. They ask if she needs any help (as the Turtles pull up their hoods to hide their identities) and she politely declines the offer. As the locals drive away, a young boy in the backseat gets a look at Mikey as he pulls down his hood. April pulls the truck off to the side and figures they might as well camp where they are. As they make camp and Don explains the science behind the Northern Lights to everybody, Ninjara loses interest and marches off to be alone. 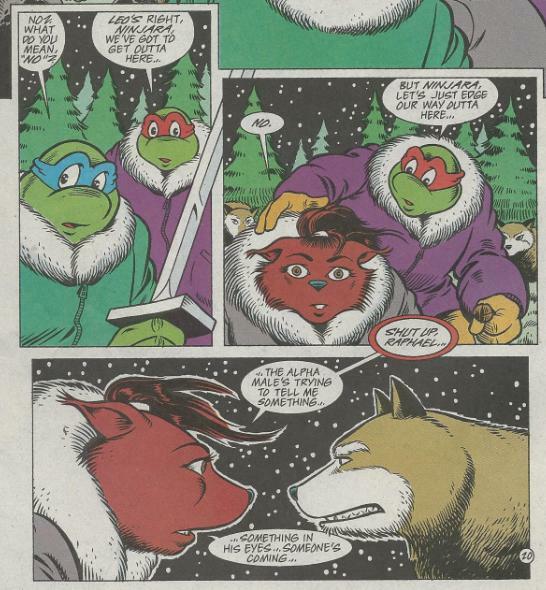 Raph finally confronts her and she explains that he simply hasn’t been paying enough attention to her; being too caught up in his own adventures to ever ask how she feels or what she wants. 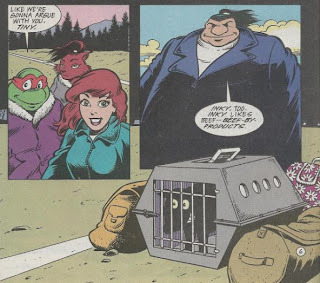 In fact, she feels as though she’s lost sight of her own individual purpose; merely tagging along with the Turtles on all of *their* adventures. Raph is shocked, but before he can try to work things out with Ninjara, she hears the same wolf howl and runs off to follow it. Leo shows up an instant later and together they tail Ninjara. They eventually catch up with her and the three find themselves surrounded by a pack of wolves. Leo and Raph try to talk Ninjara into backing away slowly, but she orders them to shut up, as she feels the alpha male is trying to tell them that someone is coming. Just then, Don, Mike and April arrive, ready to fight. They aren’t the ones that the alpha male was trying to warn Ninjara about, though. That individual is Mokoshan. Angry and tired of trespassers in his forest, the wolf-man swears to kill them all. On the tarmac at Fairbanks International Airport, the jet heading to Japan accidentally leaves without loading Inky’s pet-carrier. 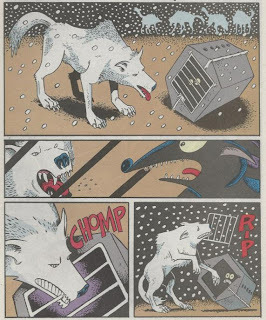 The poor Chihuahua whimpers and struggles to get out of his cage, but gives up as the snow starts to fall and be begins to freeze. Hearing his cries, a pack of wolves come onto the tarmac and chew the door off his cage. Inky follows the wolves into the wilderness. 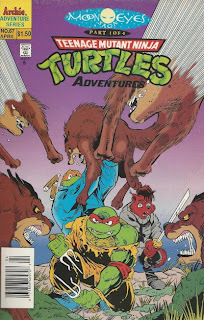 *This story is continued from TMNT Adventures #61. 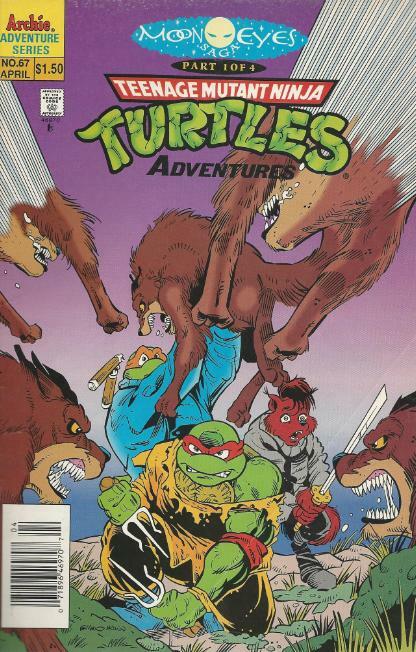 The story continues in TMNT Adventures #68. *Tattoo and Inky last appeared in April O’Neil #3. *"J.D. Vollman", like "Dean Clarrain", was a pseudonym used by series writer Steve Murphy (why he changed pseudonyms is unknown). *This issue also contained an Inky bonus story, “North to Alaska, Part One” by Jones, Talbot and Lawson. And so begins the story that gradually writes Ninjara out of the series. Not that it matters, I suppose, as TMNT Adventures wouldn’t last much longer after this arc, anyway. As I brought up a long time ago when Ninjara was first introduced, I never felt sold on her romance with Raphael. It always felt like a pairing done out of convenience; “You’re a mutant ninja, I’m a mutant ninja… Let’s make out!” I’ve since come to tolerate Ninjara and even enjoy her a little, despite the fact that in forty-something issues as a supporting character, she ultimately brought next to nothing to the dynamic aside from a fifth pair of hands and a fifth voice to spout generic, interchangeable dialogue that anybody could have spoken. There’s nothing particularly strong about her character; her only memorable aspect being who she’s dating. They could have swapped her out with Mona Lisa and it would have had zero impact on the flow of TMNT Adventures what-so-ever. I don’t hate Ninjara like I used to, I just find her extremely bland. Seemingly the only reason fans cling to her is because they have a… “thing” for her. Hey, whatever floats your boat, weirdos. Murphy (under new pseudonym, "J.D. Vollman") seemingly shares my appraisal of Ninjara’s character and brings all her foibles to light in this opening chapter of the “Moon Eyes Saga”. Murphy addresses the fact that Ninjara and Raph never shared much in common beside a devotion to martial arts and their infatuation with one another was simply a shallow teenage crush. Future-Raph, in previous issues, tries to stress that Ninjara was “the one” and Raph should have done everything in his power not to lose her, but I think Murphy had a better understanding of their so-called romance. Ninjara actually gets a bit meta when she finally explains to Raph why she’s pushing away from him. All she’s done since they’ve met is tag along on his adventures, fighting Raph’s enemies and following, well, HIS story. It’s as though she’s realized that she’s become nothing more than background dressing and that her joining the Turtles has only stunted her growth as a character; she’s there to give THEM support rather than pursue any development of her own. While Ninjara’s cold and irritable treatment of Raph at the start of the story certainly feels out of the blue (and, truthfully, there’s no build-up to her snapping in any of the previous issues), she’s certainly not misguided in her behavior. As for Raph’s culpability in all this, she accuses him of being too wrapped up in his own moods to pay her proper attention and, at least from what we’ve seen, that’s very true. Raph is perhaps the most teenage of the Teenage Mutant Ninja Turtles; a mood-swinging, selfish jerk that feels the world is out to get him and everything must revolve around him in some way. Even when Ninjara was introduced as his love interest, it never served to mellow him out or allow him to grow; he still kept acting like a self-centered brat all the way up through Slash’s funeral. Ninjara basically outgrew him and that reality adds an even more pathetic layer to Raph as we see him in the future. Future-Raph is constantly pining over what essentially boils down to his “high school sweetheart” and, even a hundred years later, continues to date fox-women like Mezcaal to fill the void Ninjara left behind. He basically never, ever got over her. As for the Inky back-up, it’s some more cute pantomiming ala the previous Inky serial. I do have a soft spot for dogs, so seeing Inky whimpering in his cage was a little sad. I always hated crating my pets as a kid since I’m a sucker for dog whimpering. Anyway, more broken hearts and furry-bait in the next few issues. If you’ve ever felt fed up with Raph’s selfish jerkitude, then you’ll probably enjoy the “Moon Eyes Saga”. He finally gets what’s coming to him. I had completely forgotten about the Inky backup stories in these issues! Is Vollman a pseudonym a la Dean Clarrain? I can't recall finding any information of him anywhere, and one would think that Archie Comics would simply pick some other writer that was already working for them at the time.